On November 28, join the movement dedicated to giving back. Sport is a great unifier of people. It teaches life lessons such as dedication, passion and perseverance. Top tier athletes inspire others to action. By being personally involved with an organization that supports high performance athletes I hope to help inspire the next generation of athletics and to encourage participation in sport and all of its societal benefits. Show your support for the international day of giving by hashtagging #UNSelfie and #GivingTuesdayCA on Twitter, Facebook, and Instagram. Tomorrow, the Canadian Sport Centre Manitoba will be participating in Giving Tuesday for our second year ever. It has been our mission for 20 years to provide support for the exceptional athletes who will someday become leaders and advocates in our communities, as well as Olympic champions. with the support they need. In the wake of Black Friday and Cyber Monday, Giving Tuesday works to promote charitable giving throughout the world. Tomorrow, millions of Canadians will join the movement dedicated to giving back by supporting charities and businesses in their communities. 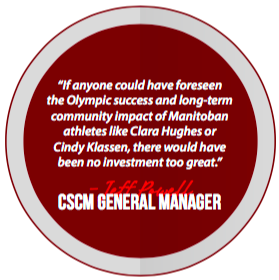 or by visiting our Giving Tuesday page: Canadian Sport Centre Manitoba.